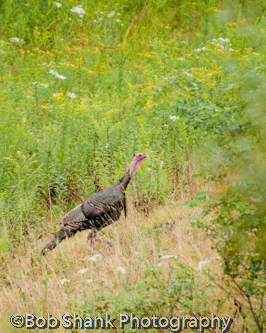 I photographed this wild turkey last month when I was in Elk County during the Elk rut. It was my first day on the elk range and it was raining. You can see the rain in this photo and the rain made it difficult to get a clear image as you can see in this photo. But since I do not have many turkey photos yet, I spent some time getting a little wet and clicking the shutter release. This was one of the best ones of the shoot. All this to say that when we keep our eyes open in the wild outdoors we never know what we are going to see or experience! I love walking through the mountains. There is nothing better or more exhilarating than walking through the wilderness. I love the mountains and the time I get to spend in them is precious to me. The wild animals are all around and when we get the opportunity to see one we should be thankful. There is so much to see and experience outdoors. Believe me, I would much rather take a walk in the wild rather than play a video game or surf the internet. It just isn’t the same! This turkey was with a flock of 13 other turkeys. The flock was feeding in the grass as the rain fell. It was a very special few moments for me and I only wish I had a longer lens to reach out and get closer photos of these beautiful birds. This is an interesting time of the year for bull elk. Antler growth has occurred for some time now. 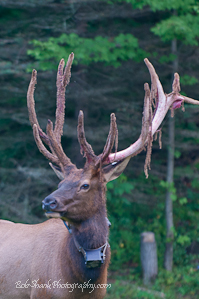 The antlers, coated in velvet to provide nutrition for growth, are nearly done growing. The velvet that was so vital to their growth is now just in the way. It is starting to peel and fall off the antler. From what I witnessed last week, it seemed to me that the bull’s experience some form of itchiness and some low-level but annoying experiences now with this velvet. They rub their antlers on trees and bushes, shake their head from side to side, and even try to use their back hoofs to scratch the velvet off their antlers! The breeding season is only about a month away, so eating and gaining strength and energy are critical if a bull expects to be in the running for a harem. Yes, this certainly is an interesting time of the year for the bulls. Last week I captured two shots of bulls in this velvet shed. The first is a better photo in my opinion, but the bull is wearing a collar. This is not uncommon and the Pennsylvania Game Commission often uses collar transmitters to track elk and learn more about their behavior. It is a great tool for the biologists, but not so attractive in a photograph. My son has a great perspective on this that I definitely agree with. He says, get over it dad, it’s part of the story of the elk, so let the collar be seen. Okay, but it could have been such a great, breath-taking photograph…. okay, calm down, listen to my son’s logic. This is part of the elk story. Get over it. I am so glad that we have elk in Pennsylvania. I am witness to the habitat improvement that not only supports the elk in our state, but many other wildlife species as well! On our property up on Winslow Hill we routinely and regularly see deer, rabbits, turkey, and grouse. We also see an occasional black bear or coyote, and much more! This careful and calculated protection of the land is vital for the survival of the elk herd and also supports all kinds of wildlife. The elk are amazing animals. I can literally sit and watch an elk, even a cow, for hours. Some people only get excited about the big bulls, but I don’t care if it’s a bull, a calf, or a cow; they’re all fascinating and beautiful to me! The subjects don’t talk back! While this is true about wildlife I am being facetious of course. Although there are some days after dealing with difficult people when I do prefer being alone with wildlife! Seriously, I can think of nothing better than spending several days out on a mountain photographing wildlife. It does not matter to me if the subjects are elk, deer, turkey, rabbits, grouse, squirrels, birds, or chipmunks. The thrill of capturing their interesting and fascinating movement with a camera is a thrill to me! This past week I was with my son, James, which come to think of it, is another excellent reason to photograph wildlife! We spent parts of three days on the elk range in Pennsylvania near our vacation property. The bulls are beginning to shed their velvet and we located a number of bulls on our trip. I can stand there all day photographing and watching the elk and think nothing of it. In fact, it is in these moments when all else is shut out that I most love. Life is far too fast-paced these days and I am definitely guilty of trying my version of running the rat race. But up there in the mountains life seems to take on a different and fuller meaning. If I could photograph wildlife for a living I would definitely do it! One of the things that amazes me about wildlife photography is that I always seem to learn something new about the animal or bird I am shooting. I have been a hunter since I was twelve years old. That is many years of spending time in the mountains and fields! Yet, no matter how much time I spend afield, I always learn something new. Watch an animal, even a bird, for any length of time and I certain you will begin to see things you did not notice before. Observation is an incredible learning tool. My grandmother used to enjoy sitting in a crowded area and watching people. As a kid I could never imagine how watching people could be so exciting and pleasurable for her. Now that I am older and wiser, I think I am beginning to see her point. I also thoroughly enjoy the challenge of trying to share the beauty of nature with others who cannot experience it firsthand. To capture the beauty of the wild takes a great deal of effort. We have to weather the elements, locate the wildlife, be at the right the exact right place at the right time, use our photo skills, and hope that we got lucky! Plenty of things can go wrong and often do. Perseverance and patience are critical and I am slowly, albeit slowly, learning these important skills necessary for wildlife photographers. Being out in the wilderness is another side benefit. What can rival spending time in the beauty of God’s creation? Walking through the woods in itself is enjoyable to me. And then when wildlife suddenly appears it can almost take our breath away. I often wonder, how many deer, elk, or other wild animals did I walk by without seeing? These creatures have learned the art of camouflage and stealth out of necessity. Their very life depends on it! When we get a little wet or uncomfortable, we can hightail it back to camp and warm up. These wild animals do not have that luxury. 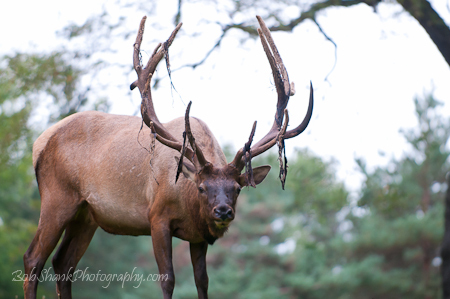 This week I enjoyed myself as my son and I spent time on the elk range behind our cameras. I love photographing wildlife! We didn’t see many elk last week. It was very hot and humid so the elk were probably seeking relief in the out of way places. My son and I only saw two bulls in three days, not counting a couple spikes. However, not all was lost. While we didn’t see as many elk as usual, we did see a lot of wildlife. We saw 5 bear, including a sow and 3 cubs, 10 deer, 52 turkey, and a hawk! Today I am posting a photograph of the one turkey we saw. I do not have many photographs of turkey because they are elusive and difficult to photograph in the wild. They are beautiful creatures and seeing 52 in 3 days was incredible. Some were hens, some were babies, and some were gobblers. 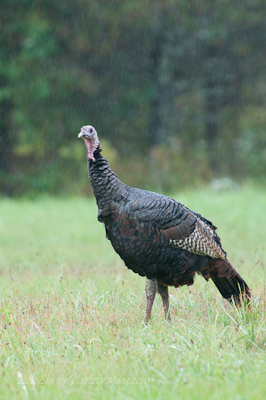 This is a photo of one of the gobblers. He was walking up the mountain and the goldenrod provided a very nice background for this photo. As I said, you just never know what you might see when you’re in the mountains.